Fireweed shoot season is upon Southcentral Alaska.Fireweed (Epilobium angustifolium) grows along Alaska’s roadways and waste areas (and throughout North America as far south as California in the west and the Carolinas in the east). 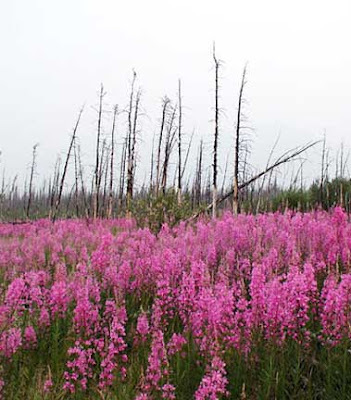 Spreading rapidly on underground runners, fireweed is one of the first plants to reestablish itself after forest fires. Fireweed’s brilliant magenta flowers brighten Alaska’s summer landscape and, in the kitchen, are an attractive salad garnish. The flowers are also the source of fireweed honey, a popular Alaskan sweetener. (Coming Soon: I just checked the woods and, as of today, the Devil’s Club is ripe for picking.) UPDATE: My post on harvesting and preparing Devil's Club is here. For 2 people, I prefer making 1 omelet in a large pan and cutting it in half, but you can also make 2 individual omelets in a smaller pan. 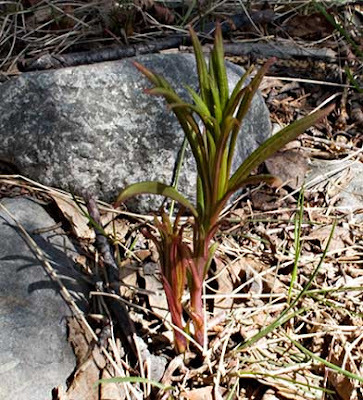 To clean fireweed shoots, trim off any browned or damaged bits, and cut into 1” lengths. Taste, and if the fireweed shoots are bitter, blanch them in boiling, salted water before starting the recipe. Fireweed, huh? I thought only natives ate this stuff... I guess I was wrong! Is it a popular foodstuff in Alaska? I have never eaten it myself. Very interesting, haven't heard of this. You amaze me, I've never heard of fireweed. That definitely looks like an omelette that I could enjoy. I love this foraging-talk! I'm familiar with fireweed, and I vaguely remember reading about it being "edible", but I know I've never read about what you might call culinary uses. It's too late in the year for it here in California, but I'll keep this in mind for next year. Thanks, Laurie! this wild green looks pretty amazing laurie - i am in awe of what a place like alaska can offer to its people. wonderful post, it made for a good read. i await that devils club post with great eagerness. 18 hours of sunlight is also pretty amazing - what time does it get dark in the 'evening'? I've never heard of fireweed either. This is very interesting and I like the use you made of it. Sam, I'd say the practice of foraging wild greens is practised less and less, world wide. I picked up the habit in Greece and continue it in Alaska. You should try some fireweed next spring! Kalyn, and you're hard to stump! Cheryl, like I mentioned to Sam, I learned about foraging for wild greens in Greece and realized I could do it just as easily in Alaska. I enjoy gathering them - plus, wild greens are very good for you. Hunter, I feel exactly the same way! But there's fireweed in California - not sure where exactly you are - so you might be able to find some next spring. LuLU - foraging R us. Maria, the sun is now rising a little before 5 am and setting around 11 pm. Of course, there still is some light after the sun goes down. Mariana, that is really very interesting - I had no idea that fireweed grew in Greece and the etymology is also interesting. Do you know the Greek name for it?? Devil's club, Fireweed? I can't wait to finish rest of your posts (that I missed these past weeks) to see what else you've got. Fireweed's Greek name is epilovo. Local huntsmen know it well and harvest it for boiled salads or add it to tsigariasta horta. Suganya - glad to be keeping you guessing! 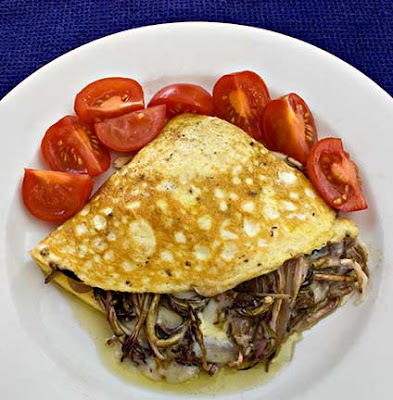 I've never heard of fireweed shoots but I am really enjoying the picture of the omelete packed to the gills with the mysterious plant. Being an an adventurous person, I wouldn't hesitate to give this a try. Grows in Northern Illinois, both in burn zones, and arbitrarily through the forest and roadsides. Good spinach replacement, as a vegetable with current food prices, makes a tasty salad; Jelly and Honey recipes are great. the leaves are available at least 9months of the year here, I could save big on groceries... Heart smart foods are at a premium up here.